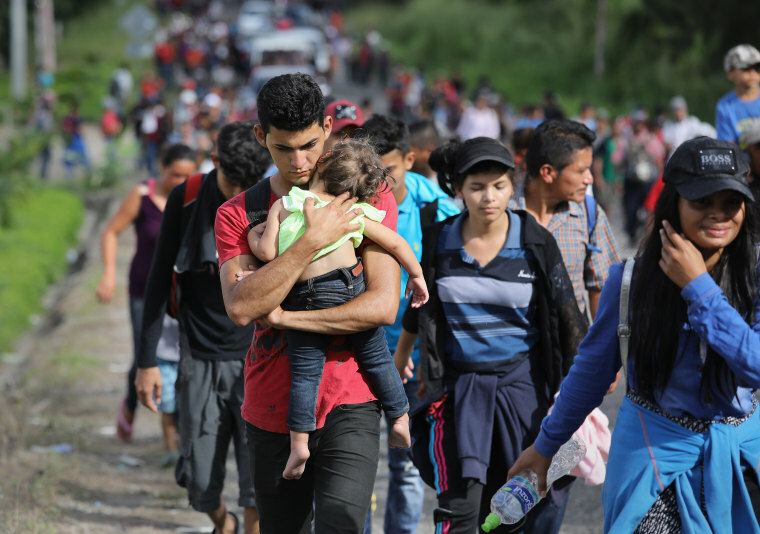 A caravan of migrants from Honduras continued north toward Mexico and the United States as Trump threatened to withdraw aid from the country. A caravan of migrants from Honduras continued north toward Mexico and the United States on Tuesday as President Donald Trump threatened to withdraw aid from the country over the group — despite the fact that the group was in Guatemala. "The United States has strongly informed the President of Honduras that if the large Caravan of people heading to the U.S. is not stopped and brought back to Honduras, no more money or aid will be given to Honduras, effective immediately," Trump tweeted Tuesday morning. Tuesday evening he expanded his warning to include Guatemala and El Salvador. "We have today informed the countries of Honduras, Guatemala and El Salvador that if they allow their citizens, or others, to journey through their borders and up to the United States, with the intention of entering our country illegally, all payments made to them will STOP (END)!" Trump tweeted. Various estimates put the group at 1,600 to around 2,000 people. Overnight, they stayed in Esquipulas, a Guatemalan town after a short initial standoff with police trying to prevent them from advancing. The Honduran Ministry of Foreign Affairs and International Cooperation exhorted its citizens to stop participating in the caravan because it will put their lives at risk. In a statement Tuesday the ministry said that migrants had been lured north by false promises that Mexico would allow their passage and the United States would grant them asylum. Before heading further north on Tuesday, dozens attended Mass at a local Roman Catholic basilica to receive a blessing for their journey, according to The Associated Press. On Tuesday, they were heading north toward the city of Chiquimula. Guatemala's Red Cross said Tuesday that it had provided care to nearly 400 people associated with the caravan. A Guatemalan priest estimated that more than 2,000 migrants had been fed at three shelters run by the Roman Catholic Church. Later Tuesday, Vice President Mike Pence said on Twitter that he had spoken to Honduran President Juan Orlando Hernandez and told him "no more aid if caravan is not stopped." Hernandez has previously said cuts in U.S. support for Central American countries would hinder attempt to slow illegal immigration. The Central Americans refugees said they were fleeing violence and poverty in Honduras and seeking a better life in Mexico and the United States. Carlos Reyes, 20, told the AP he was fleeing after men tried to kill him a week prior because he is gay. Meanwhile on Tuesday afternoon, Guatemalan authorities detained former Honduran lawmaker and caravan organizer Bartolo Fuentes, the AP reported, citing an anonymous official with Guatemala's migration agency. Fuentes and two others were reportedly detained for not having registered with migration officials when they entered the country. The group was met by about 100 Guatemalan police officers, some in riot gear, at the border. Some of migrants held a large banner of the Honduran flag, while another migrant in front waved a Honduran flag high in the air as they approached the officers, who initially did not let them pass. There was a standoff for about two hours before the migrants began walking again, according to the AP. At that point, officers did not stop the group but walked with them several miles into Guatemala, according to the AP. The officers then set up a roadblock outside of Esquipulas, the AP reported, telling them they had to go through immigration at the border, but the group refused and eventually police let them pass. On Tuesday, Guatemala's Ministry of Foreign Affairs said that in response to the situation it would help the migrants currently in their country, saying officials would carry out the necessary actions to "identify and document those who came into the country irregularly to the Guatemalan territory in order to regularize their migratory situation" and provide assistance with health, safety and protection. Previously, Guatemala’s Institute of Migration had said the country "does not promote or endorse irregular migration in any forms" and said the caravan was not respecting the nation’s migration laws. Mexican authorities have also said the migrants who did not comply with legal requirements to enter the country would not be allowed entry. The group began with an initial roughly 160 people who had gathered early Friday at San Pedro Sula to depart north with higher safety in numbers. Trump has previously threatened Honduras over its aid in April, because of a previous caravan, but did not follow through. Organizers of that caravan, the immigrant rights group Pueblo Sin Fronteras, released a statement Tuesday in support of the new caravan. "We demand respect for the international right to migrate and to seek asylum and refuge under domestic and international laws," the group said in a statement, adding they insisted the governments of the countries along the journey "not use repression, violence or force against the people who are fleeing as part of this mass exodus. In May, the Trump administration announced it was ending a temporary protected status program covering about 60,000 Hondurans in the U.S. They were first given that status after the massive Category 5 Hurricane Mitch in 1999 under President Bill Clinton. The program is set to shutdown completely in January 2020. Earlier this month, a judge blocked the administration from ending similar protections for immigrants from four other countries: Sudan, Nicaragua, Haiti and El Salvador.